Warren Buffet’s Investment Checklist – The Secret to His Success? Warren Buffet is known as a god among investors and entrepreneurs. He is currently the 3rd richest person in the world and the Chairman and CEO of Berkshire Hathaway, a holding company that owns hundreds of brands including GEICO, Dairy Queen, Heinz and has major investments in American Express, Coca-Cola, and IBM. Warren Buffet is known for making stellar investment decisions. Putting his money on business fundamentals and long-term success rather than worrying about new fads and market movements. So, what is the secret to Warren Buffet’s success? In Robert Hagstrom’s book The Warren Buffett Way, John Wiley & Sons Inc., New York, 1994 he reveals a checklist that Warren Buffet uses when making investment decisions. Obviously, this is a high-level check before due diligence but it’s the first step Warren Buffet takes when making an investment decision. Read it, use it. “An investor needs to do very few things right as long as he or she avoids big mistakes.” Above-average returns are often produced by doing ordinary things exceptionally well. Buffett’s experience has been that the best returns are achieved by companies that have been producing the same product or service for several years. Buffett sees the economic world as being divided into franchises and commodity businesses. He defines a franchise as a company providing a product or service that is (1) needed or desired, (2) has no close substitute, and (3) is not regulated. Look for the franchise business. Is the management rational with its capital? A company that provides average or below-average investment returns but generates cash in excess of its needs has three options: (1) It can ignore the problem and continue to reinvest at below average rates, (2) it can buy growth, or (3) it can return the money to shareholders. It is here that management will behave rationally or irrationally. In Buffett’s mind, the only reasonable and responsible course is to return that money to shareholders by raising the dividend, or buying back shares. Is the focus on Return On Equity? What is the rate of “owner earnings”? Buffett prefers to modify the cash flow ratio to what he calls “owner earnings” – a company’s net income plus depreciation, depletion, and amortization, less the amount of capital expenditures and any additional working capital that might be needed. Owner earnings are not precise and calculating future capital expenditures requires rough estimates. Is there a high-profit margin? In Buffett’s experience, managers of high-cost operations continually add to overhead, whereas managers of low-cost operations are always finding ways to cut expenses. Berkshire Hathaway is a low-cost operation with after-tax, overhead corporate expense of less than 1 percent of operating earnings, compared to other companies with similar earnings but 10 percent corporate expenses. Has the company created at least one dollar of market value, for every dollar retained? Price is established by the stock market. Buffett tells us the value of a business is determined by the net cash flows expected to occur over the life of the business, discounted at an appropriate interest rate, and he uses the rate of the long-term U.S. government bond. Can it be purchased at a significant discount to its value? Having put a value on the business, Buffett then builds in a margin of safety and buys at prices far below their indicated value. Want this as an executable checklist? 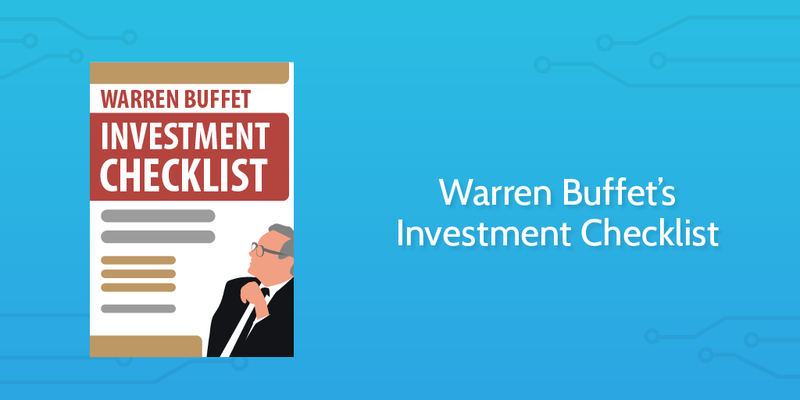 We have added Warren Buffets investment checklist to our examples inside Process Street. If you want access to this and the other templates in our examples library (plus the ability to make your own) sign up for a free account at http://process.st. I am a big follower of Warrent Buffets and able to manage my own investment using his investment advise. My portfolio gained almost 50% in the last 2 years.